If you run a Windows Server which takes advantage of the built in DNS Server, you have a nice graphical interface for viewing and managing your DNS records. However, the vast majority of the time you probably just look at these records as opposed to updating them. 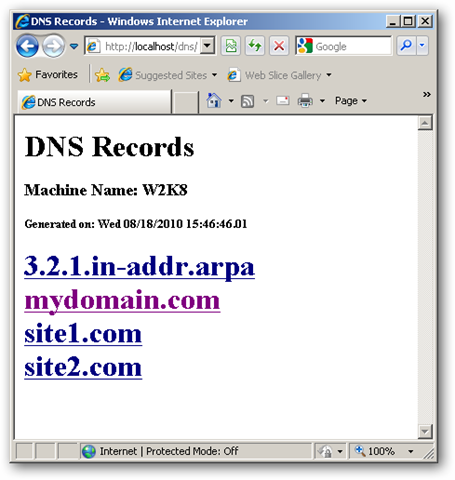 This process is not difficult, but can be a hassle as you have to connect to the DNS Server machine through remote desktop, open DNS controls and locate the record. Wouldn’t it be easier if you could simply see this information over the web? To make this functionality possible, we have a very simple script which exports your current DNS Server records to text files and makes them available via a simple indexed HTML file which can be accessed from any device with a web browser. Overall, the script’s configuration options are very straight forward. You simply need to configure the output location where you would like the destination files to end up. This folder will be populated with a ‘default.htm’ and ‘[domain].dns.zone.txt’ files. These names can be customized in the script as needed. The script makes the assumption that you have named your DNS files using the default naming convention the Windows DNS Server uses ([domain].dns). If you are not using the default naming convention, the script will not work properly. As an additional function, the script can delete unused DNS record files which are no longer active in your DNS Server. If enabled (off by default), when the export procedure fails for a DNS record file, meaning the domain was not found in the DNS Server, it is deleted. These unlinked DNS record files do not do any harm or consume any resources, so it is safe to leave them alone. If you update your DNS records often, you can configure the script to run regularly through a scheduled task so you know the information you are viewing is always current. The output of the script is read-only so any changes made to the resulting files will not be reflected in your DNS Server. The script simply reads your current DNS files from the default Windows location and then interfaces with the DNSCmd command line tool to produce the output files. The DNSCmd tool is included with Server 2008, but Server 2003 machines must install the Resource Kit Tools to put this utility on your system. The ‘[domain].dns.zone.txt’ are the output produced by the ZoneExport command. You can access the listing by viewing the output ‘default.htm’ file in a browser. If you have configured the script to export to a publically available location, you can view the output from anywhere. By clicking on a domain, you can see all the DNS information from your DNS Server for that domain. REM Directory where the HTML pages should be generated. REM HTML header info. Customize as needed. DNSCmd . /ZoneExport !Zone! !ZoneFile! ECHO !Zone! is not currently loaded in DNS Server. REM Output is always to DNS directory, so move the file to the HTML dir.